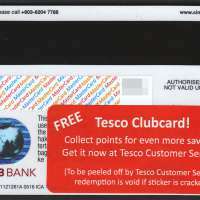 CIMB Tesco Savers Account = A Savings Account in alliance with Tesco that is issued with CIMB Tesco Debit MasterCard®. 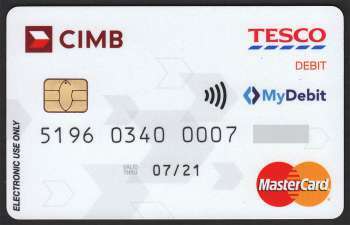 MyDebit are chip-based ATM cards issued by Malaysian banks by utilizing regular ATM card to pay the merchant at the Point-of-Sale (POS) terminal. Some of the issuing banks are Affin Bank, Alliance Bank, Agro Bank, Ambank, Bank Islam, Bank Muamalat, Bank Rakyat, CIMB Bank, Hong Leong Bank, Maybank, Public Bank & RHB Bank. MyDebit payments system is managed by MyClear (Malaysian Electronic Clearing Corporation Sdn Bhd), a wholly-owned subsidiary of Bank Negara, the Central Bank of Malaysia.